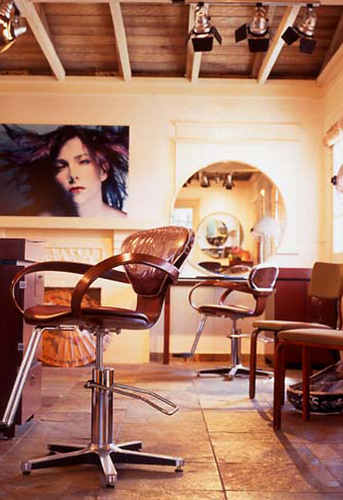 Upon entering our La Jolla, California, hair salon, feel treated as an honored guest who has come for retreat and renewal. You will be slipped into a cotton kimono, served green tea and cookies, and then pampered by confident hands. Salon Geisha evokes harmony in the environment for the senses, from contemporary European background music and lighting to the trickling of fountains, mellow colors in the furnishings, orchids, whimsical umbrellas, and tinkling wind chimes as the breeze stirs in the outdoor bamboo garden. The walls are painted to mimic the various hues of pearls creating luminosity to the skin and brilliance to the hair, which in itself, is a beauty boost for all who enter. There's even a treasure case to explore for one-of-a-kind accessories and unique jewelry for that special something from the exotic and mysterious Orient.